I am getting used to this lie in lark. But I can’t slouch around for too long…today we’re heading out for some retail therapy. It takes us about 10 minutes to drive to the city and about 40 minutes to find a park! Finally we hit the shops and first stop is my favourite fashion mecca – Dorothy Perkins. I feel the rush as I enter the store which luckily enough has a 30% off sale today – now that’s what I call precision timing! I find a couple of dresses that I’ve been hankering after and a little light jacket that will cover me for the holidays. Today, the pooch’s vehicle of choice is in his pushchair. This is my mum’s master plan because it allows her to take the dog shopping. This is one pooch that doesn’t stay home alone! 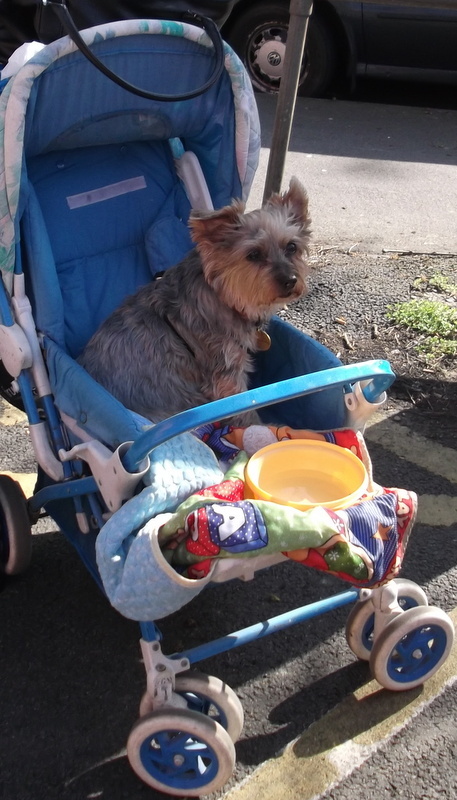 He’s a canine angel in the pram and doesn’t make a sound and once again, he is the star of the show. We find a lovely little cafe for lunch and sit outside in the summer sunshine. Just as we’re about to order, some workmen start digging up the pavement with a pneumatic drill and simultaneously almost burst our eardrums and break the sound barrier! The next cafe we visit has no shade so it’s third time lucky, as we stop at Costa Coffee, plenty of shade, good coffee and peace and quiet! The credit card gets more of a workout after lunch with a couple more dresses. Mum also finds some splendid stuff so all in all, it’s been a very successful mission! Shopping is hard work and we’re pretty pooped so we come home for a nice cup of tea. Later, I head off for my daily run. I try for the full 8km today but it’s hard yakka so I do a bit of interval training; cleverly combining running and walking! My aim is to run that route without stopping before I leave Lincoln! Tonight I try out Orange Mustard Chicken which meets with mum’s approval, even though we go carb free and give the cous cous a miss. After another visit to mum’s toffee tin there’s nothing else to do, except kick back and relax in front of the TV.